Amelia Way Pettigrew (7) and Carolina Brooks Pettigrew (10) show their medals from the SC state cross country championship competition held on November 22 at Myrtle Beach. Carolina Brooks runs the 3K with the 9-10 year old girls and her team won first place at the state meet. Amelia Way runs the 2K with the ages 8 and under girls and her team placed second in SC. The top 3 teams from each state qualify for the national championships. 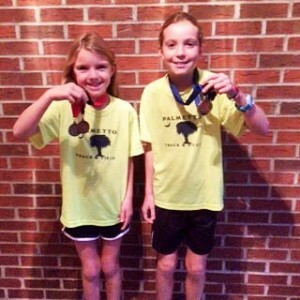 The Pettigrew girls run with the Palmetto Track and Field Club in Aiken which is coached by Charles McKeel. They look forward to the USA Track and Field Junior Olympic Cross Country Championships on December 13, also in Myrtle Beach. Over 3000 youth athletes from around the country will be competing on Saturday.